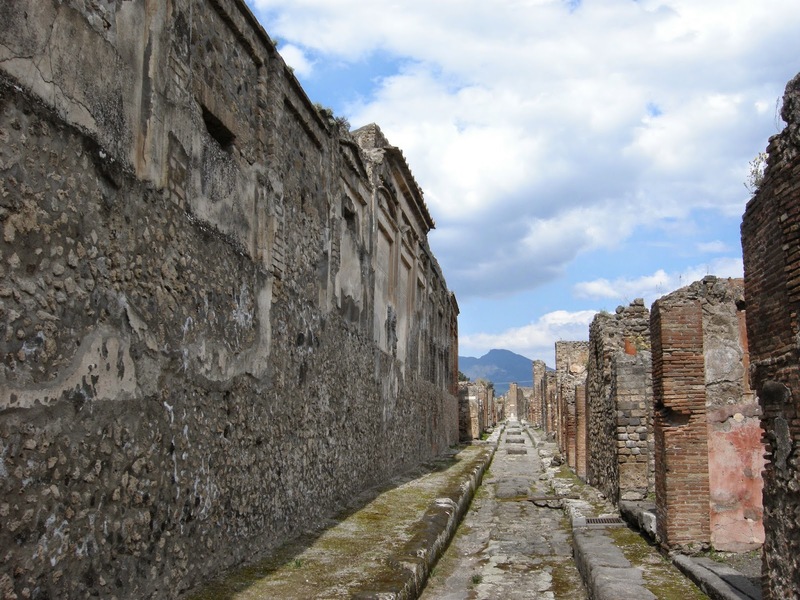 Italian geography made Italian history in Pompeii. 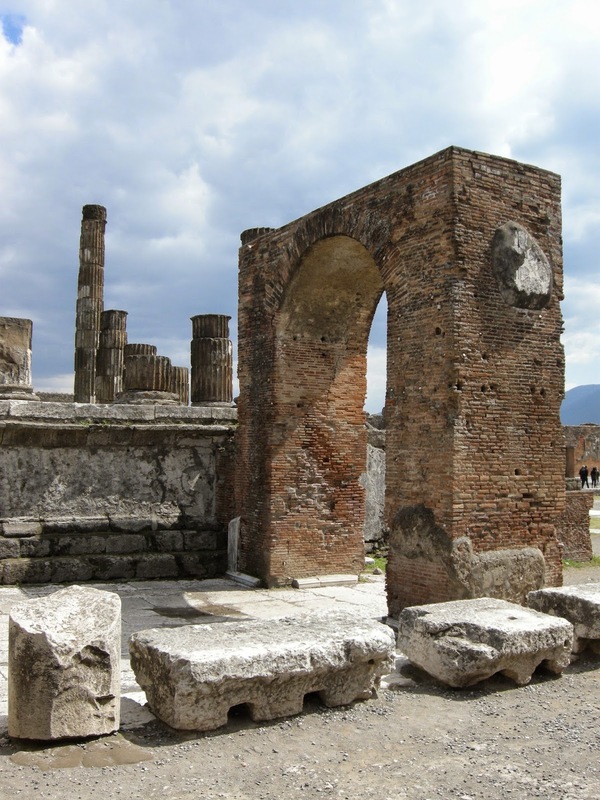 When I last toured Italy - back in 1977 - I took a day trip to Pompeii and Capri. As a result, I had an idea of what this area along the west coast had to offer. 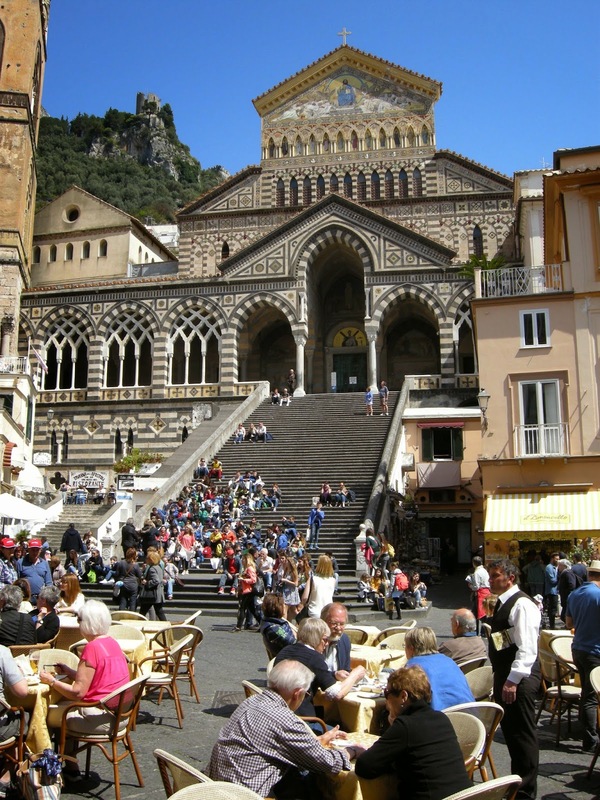 I was not familiar with Sorrento, however, and I soon realized that my memories of so long ago were very limited. 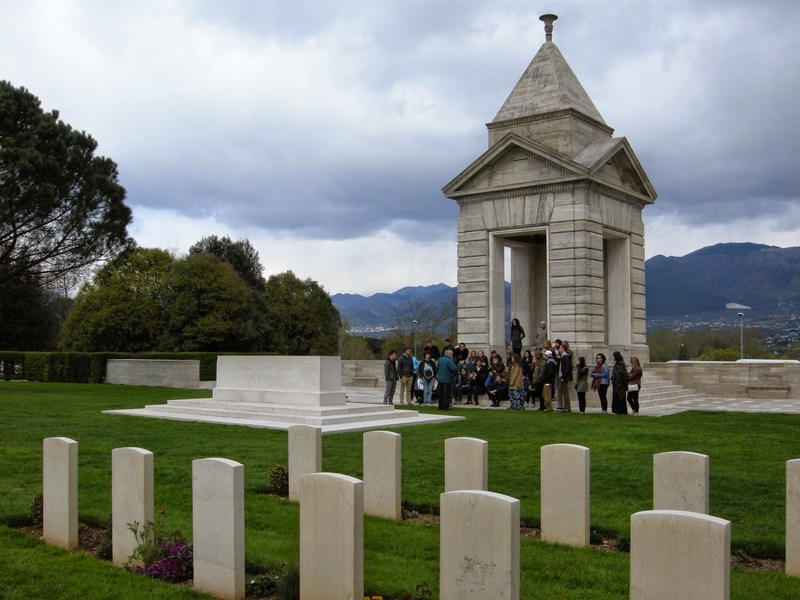 The trip from Rome to Sorrento takes about four hours, Along the way, we made a stop at Monte Casino, the site of an important battle in WWII. 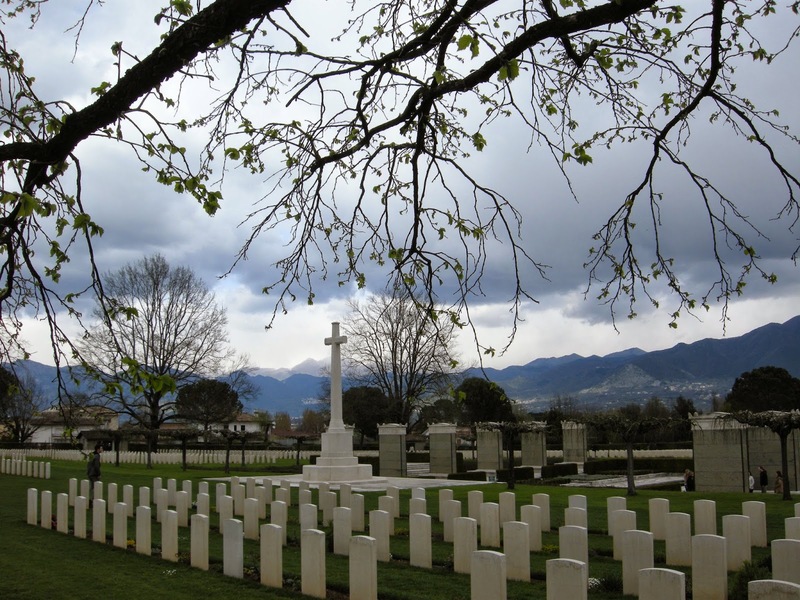 Terry's father had fought there, so he was the perfect person to explain the significance of this area, which is now a large cemetery, a war memorial. Not long afterwards, we left the main highway and headed towards Sorrento, where we would stay for the next four nights. I was awed by the scenery. 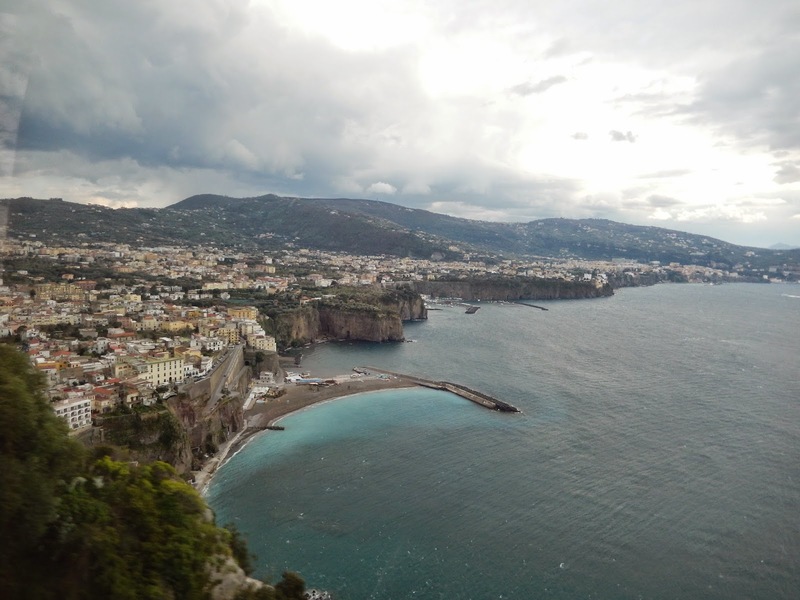 As the bus twisted and turned towards our destination, we looked down towards the Bay of Naples, and the small towns that dot its shores. Our hotel was also quite remarkable. We stayed at a lovely resort, with a dining room that afforded us views of the sunset every evening. The place was an oasis for us after days filled with sightseeing. 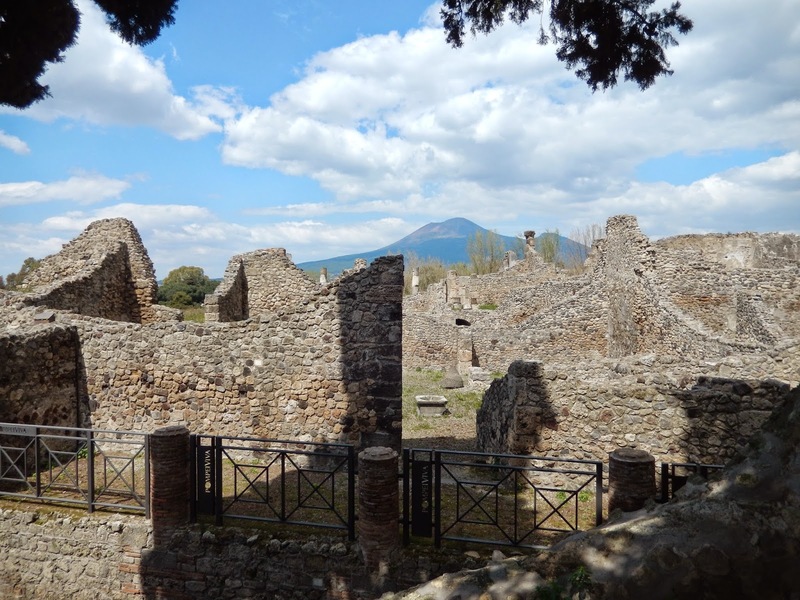 On our first full day in the area, we backtracked towards Naples to visit the impressive ruins of Pompeii. I was very much looking forward to this excursion since I knew that much more of the ancient city had been uncovered since my experience there almost forty years ago. I was not disappointed. 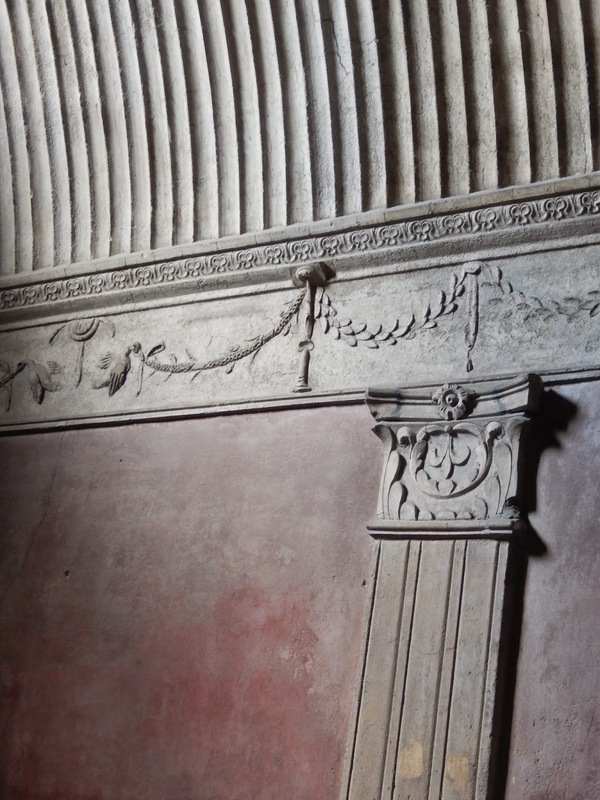 Pompeii is a wonder of archaeological preservation! Bob and I both took a great many photos, although we have left the x-rated ones out of the blog. Haha. 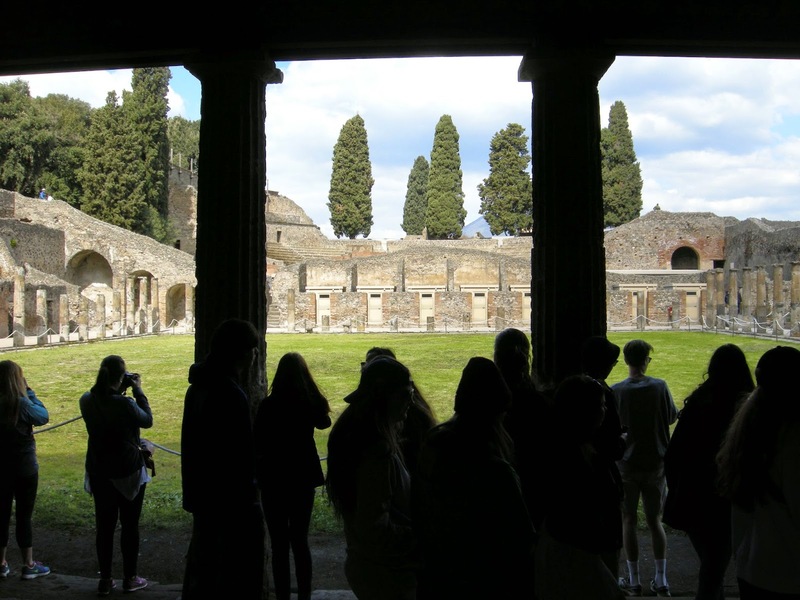 The students were fascinated by the place as well - as they should be. Is there anywhere else on earth like it? 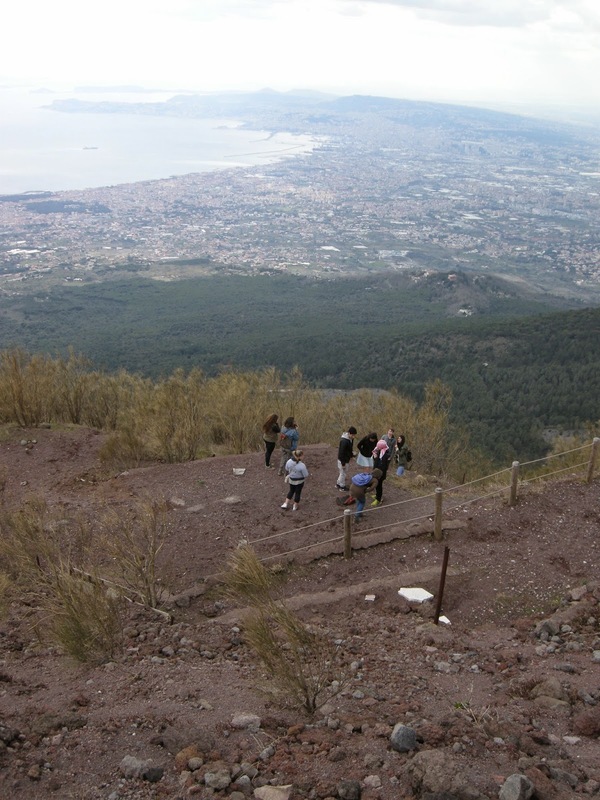 Mount Vesuvius was once much larger, but it still looms over the city. 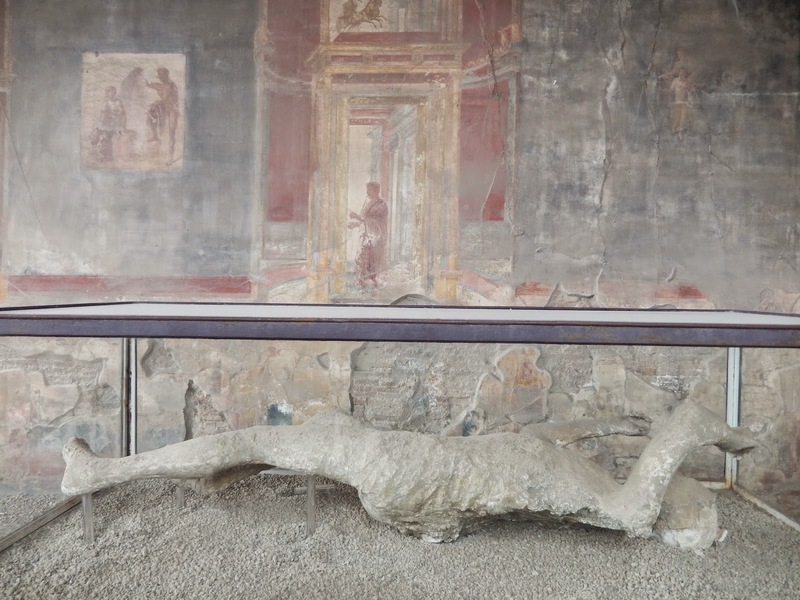 A cast of one the volcano's victims sits in a glass case below a Roman fresco. 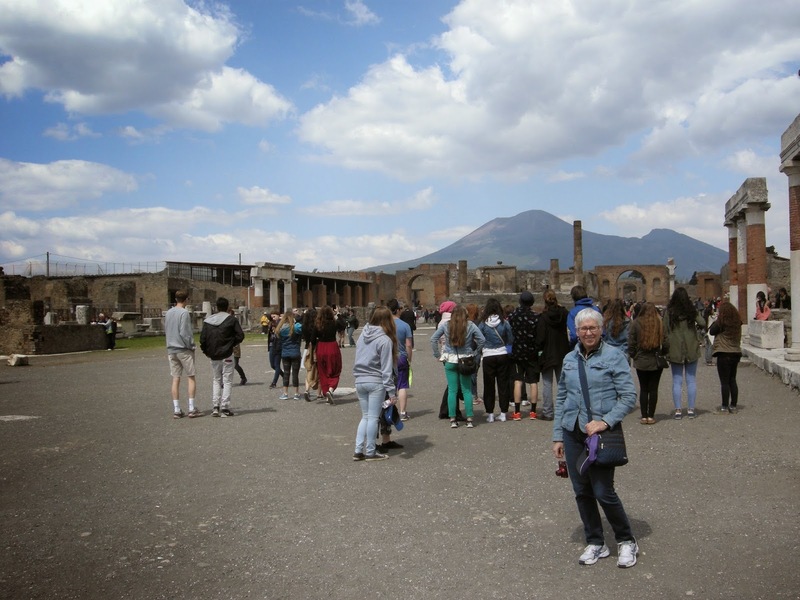 Nearby, as always, sits Mount Vesuvius - and after lunch, we were driven part way up to climb it. This was an exciting prospect. 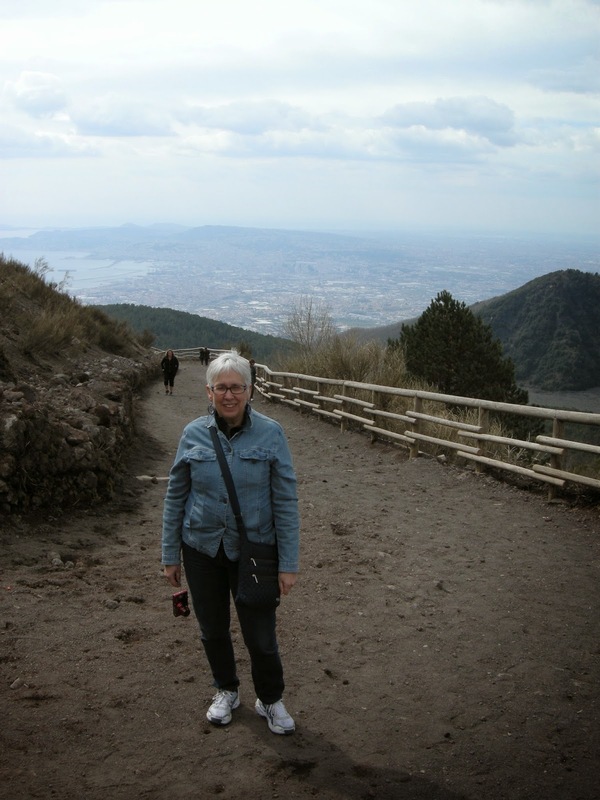 I had never climbed an active volcano. 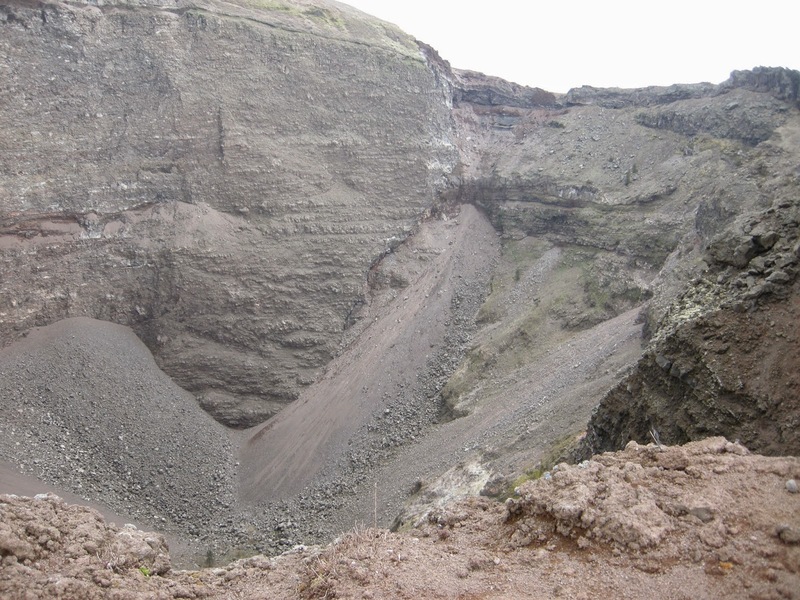 As it worked out, the ascent was not as thrilling as I anticipated, since the day had turned quite chilly and the view inside the crater was merely a spectrum of greys. Freezing on the way up. 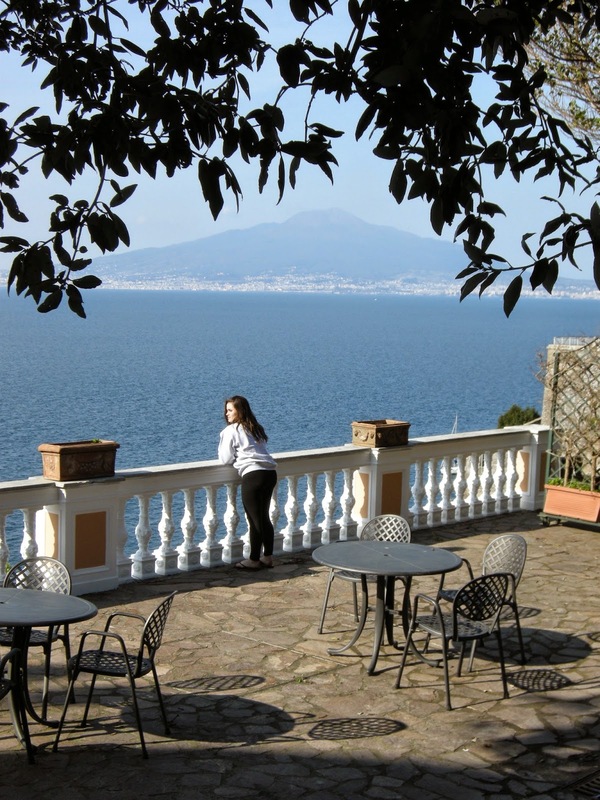 Nevertheless, determined, I climbed to the top where I was rewarded with a panoramic view over the Bay of Naples and the city itself below us. Our second full day in the area provided an entirely different experience. 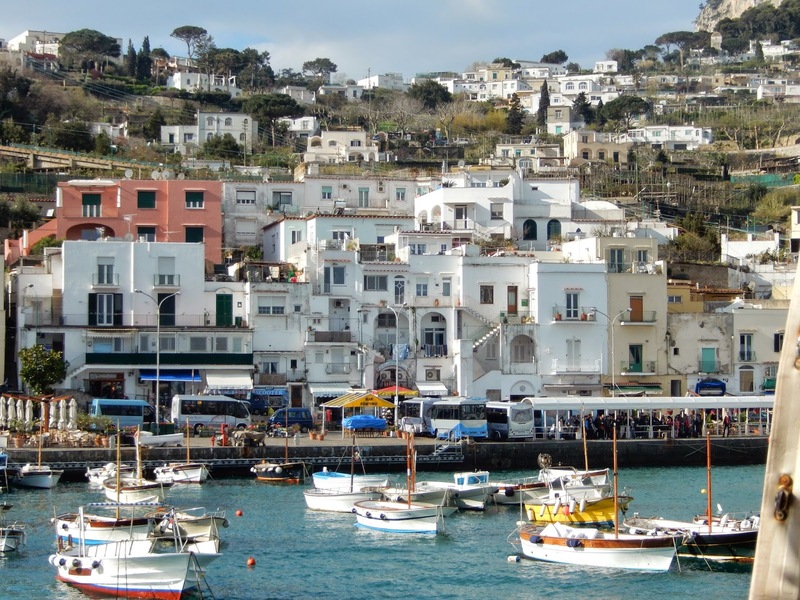 First we walked to the Sorrento harbour to board a boat, which took us twenty minutes later to the island of Capri. There we were met by our local guides whose goal was to show off this island from four different perspectives. Most of our group on the shore level. 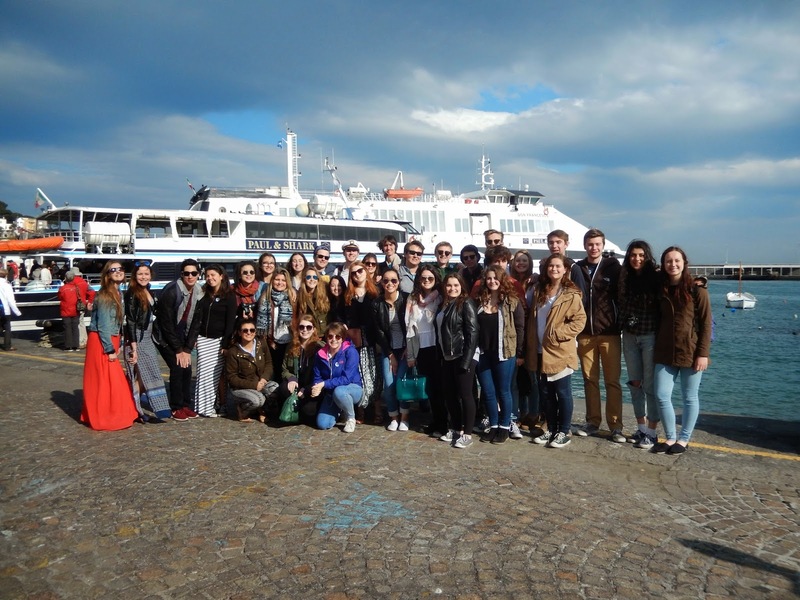 We spent only a few minutes at the first level - the shore level - long enough for a group photo. In short order, we were shuttled to the second level where we were shown where the rich and famous ate and shopped. 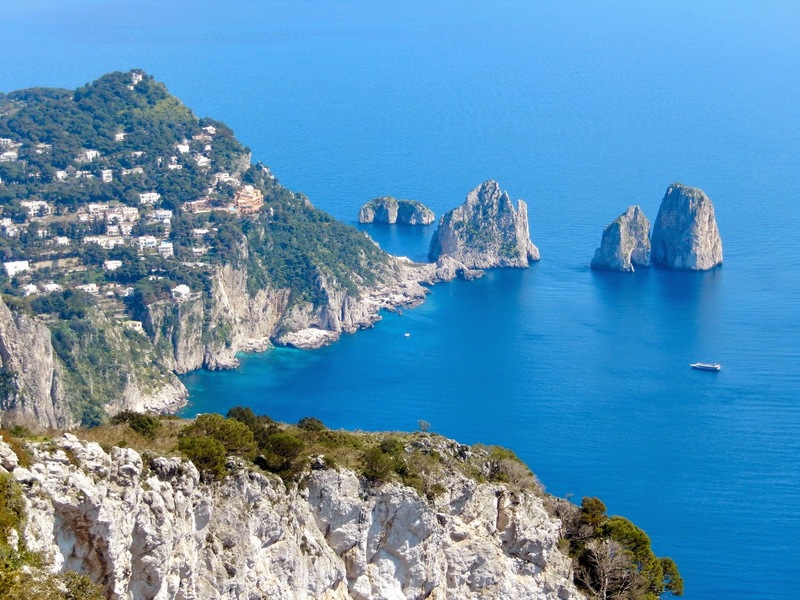 This is the part of Capri with the most exclusive hotels and the most expensive shops. Here too is a perfume industry that produces very enticing scents. 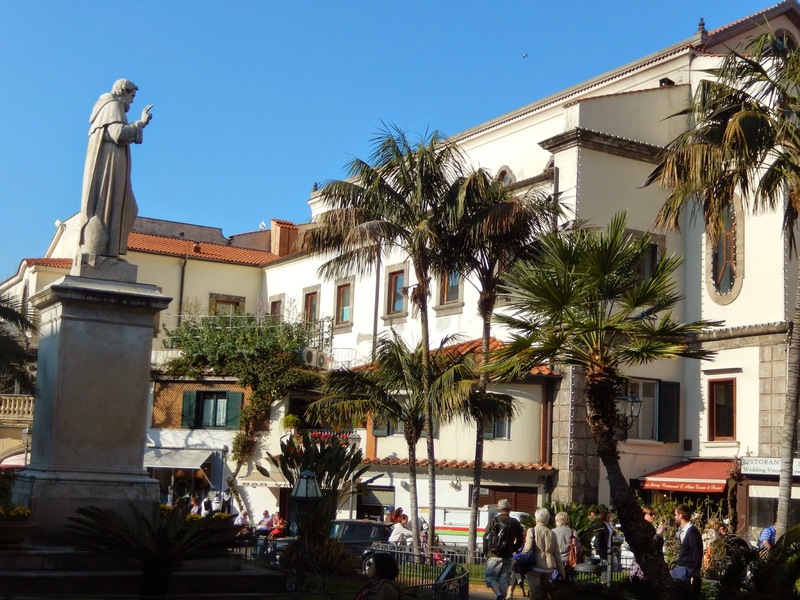 Our guide explains how a former monastery has become the centre of the Capri perfume industry. After about an hour or so, we ascended one more level to the third tier, where more shops and restaurants awaited us. Here, we were encouraged to take a chair lift even further up, in order to experience the most spectacular perspectives available. Bob and I decided against this move, until, hearing from others that I had missed a great experience, I changed my mind, spent 10 Euros, and rode to the top of the island with a couple of the boys. The view from the outlook at the top of Capri was stunning and, by going when we did, we actually had better weather conditions than those who ascended before lunch. 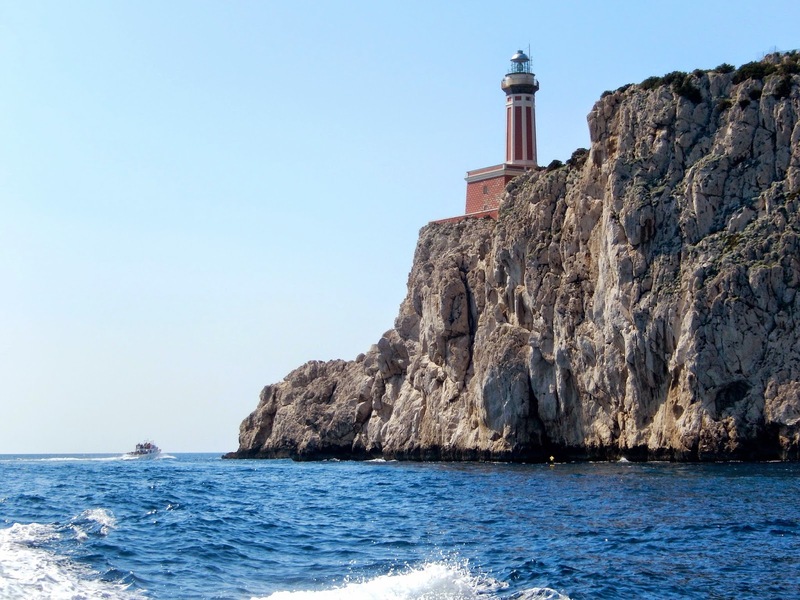 Finally, back at shore level, we opted to take a boat tour of the circumference of Capri, the famous Blue Grotto being closed on this day. Our tour guide doubled as a guide on this boat too. From here, we witnessed beautiful aquamarine waters, and interesting rock formations. On a precipice, we glimpsed a goat, a most unusual sight, according to our guide. A view of the lighthouse from the boat tour. 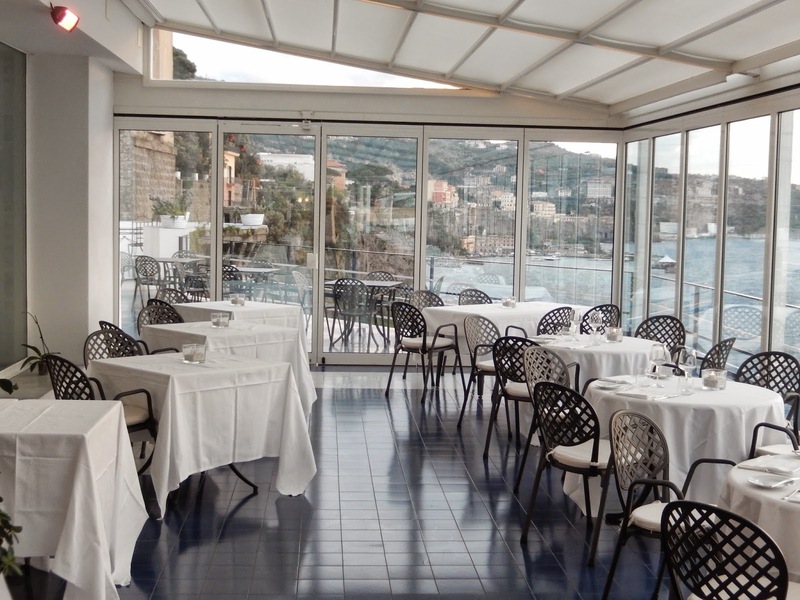 By 16:00, we were on our way back to Sorrento. I was looking forward to exploring the town itself, something we did both on this day and the next. 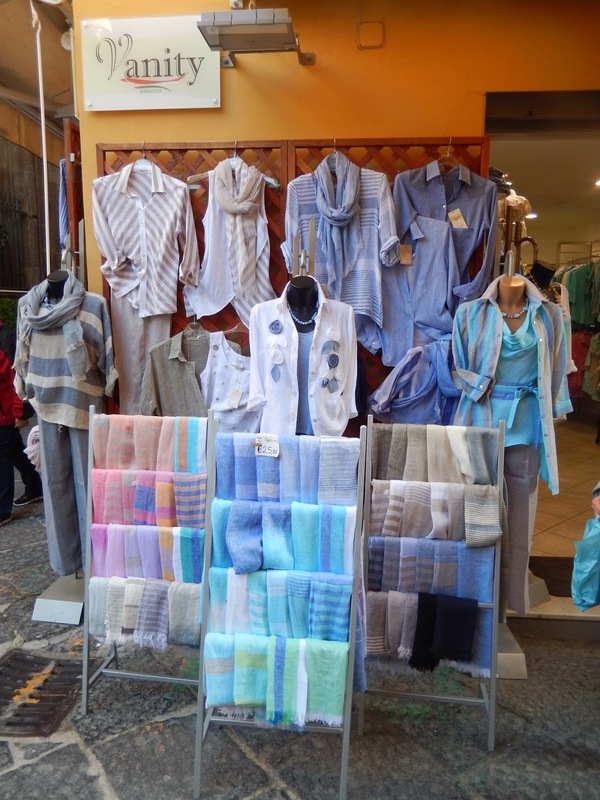 The shops were very enticing and my time in Italy was running out! 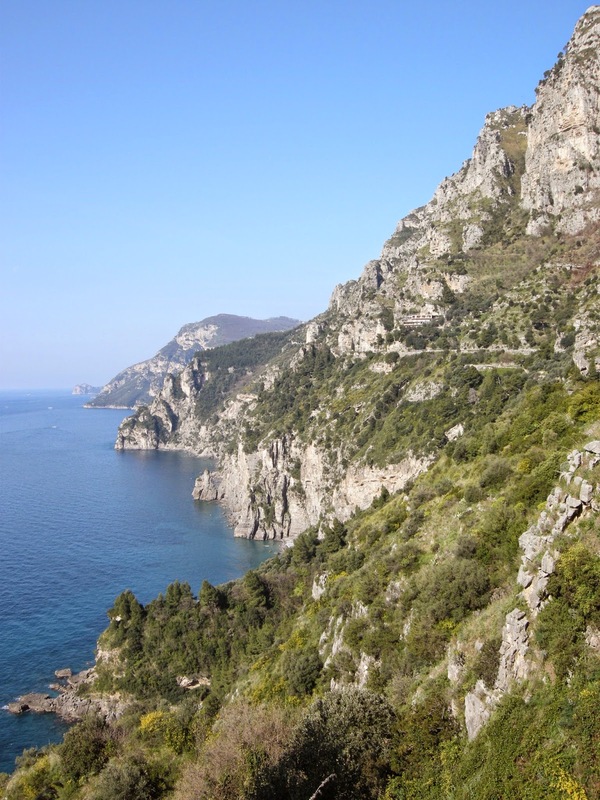 On our final day in the region, we again boarded a bus, this time to drive along the Almalfi Coast, a breathtaking – and harrowing drive. This 40 kilometre stretch of coastline takes a long time to see, as the roads are very narrow, especially for a 50 seat bus. With drivers coming from the other direction, we had several "Mexican standoffs" along the way, but Enzo, our driver, was a magician, and we completed our journey unscathed. 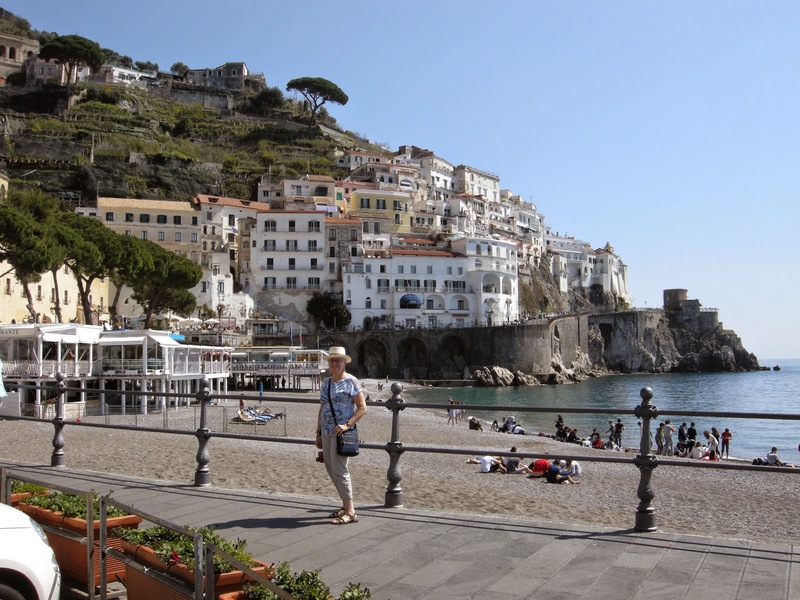 We made a stop over lunch in the charming town of Amalfi itself but while I was keen to wander, the students couldn't wait to hit the beach. On this sunny and warm day, I was content to sit outside a cafe and sample the local dessert specialty. Eventually, we made our way back to our Sorrento resort for our final evening there. 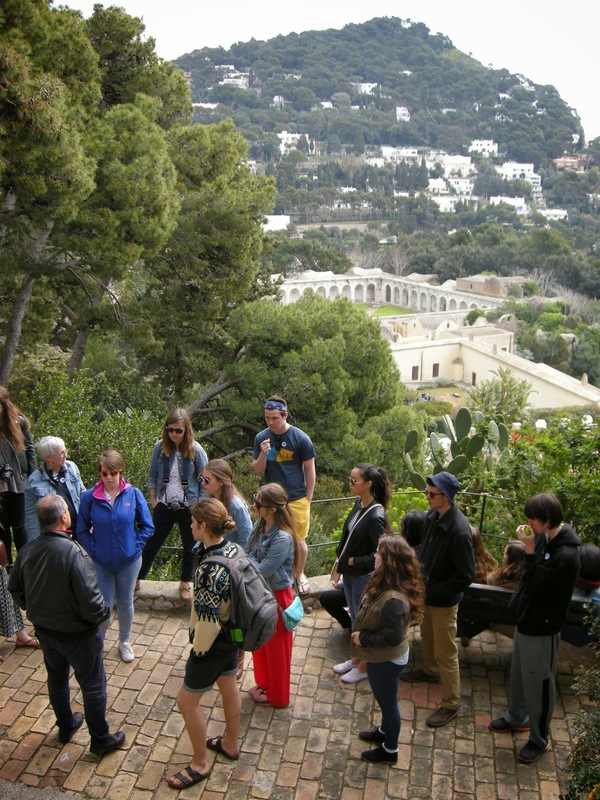 Again, the students decided to bask in the sunshine and take in the view from the resort patio. 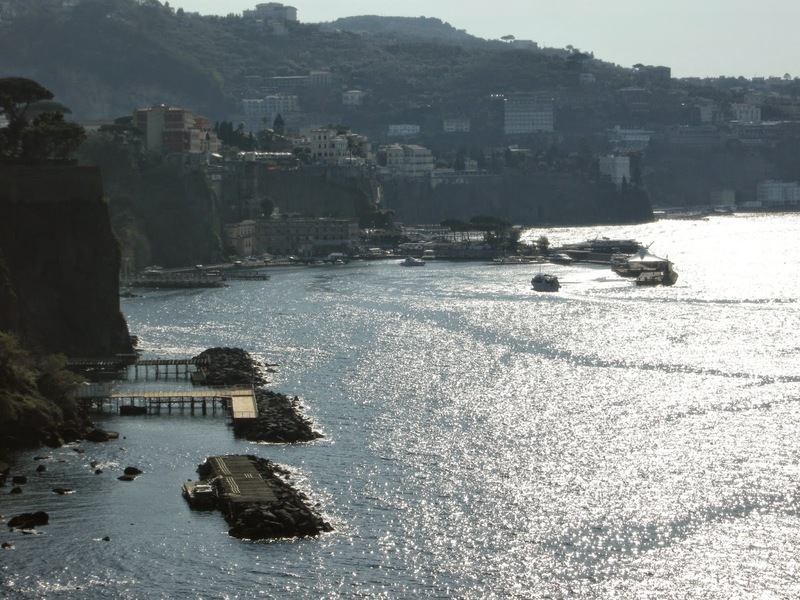 One last view of the Sorrento harbour from the hotel. 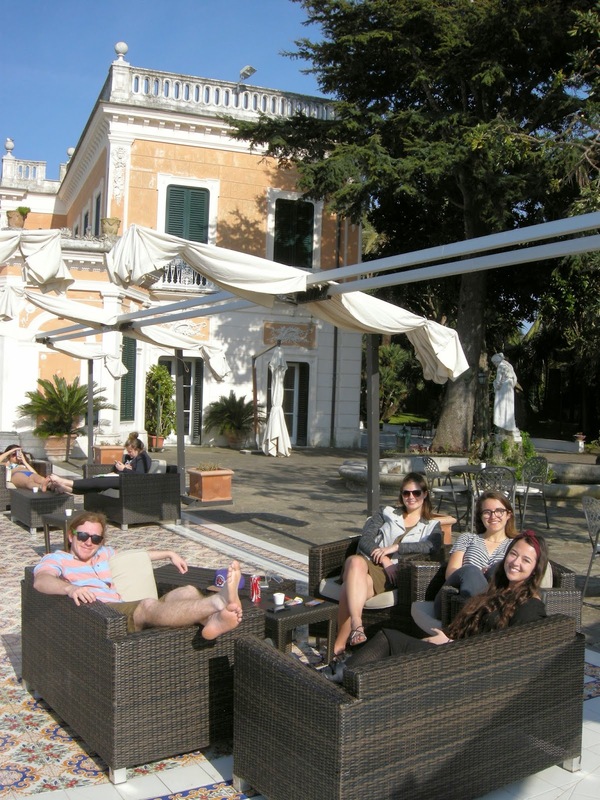 The next morning we returned to Rome, having completed the first week of our Easter vacation. Another week to go!